A magnitude 4.5 earthquake hit the west end of Montrose County on Monday, and was felt for miles around, according to the U.S. Geological Survey. The quake, which happened at about 10 a.m. about 59 miles south of Grand Junction, occurred on the Colorado side of the Paradox Basin. It had a depth of about 0.49 miles, the USGS said. Initially, the survey listed the quake at a magnitude of 5.3, but quickly downgraded it to 4.6 and then 4.5. Still, it was larger than a similar event that occurred in the basin in Utah south of Moab in 2013, and possibly the largest one of record there. That Utah event was rated at 4.3. 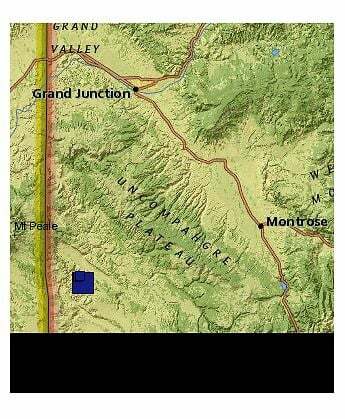 The quake was felt as far away as the Grand Valley and Moab. While emergency crews were dispatched in Montrose and San Miguel counties, that was only to search for any damage. None was reported. According to the survey, the Paradox Basin has a relatively low rate of seismology activity, often seeing quakes of a magnitude of about 2 or less. But Dave Wolny, an environment science adjunct professor at Colorado Mesa University, said such events are not uncommon in that area. Some past events have stemmed from a brine disposal injection well operated by the U.S. Bureau of Reclamation on the basin. For some years now, the bureau has been removing salt that otherwise would seep into the Dolores River, and injecting it into wells in the region. The basin already has thick salt deposits. According to several USGS and Reclamation studies, the wells have created numerous small seismic events. "The largest historical earthquakes were a M4.4 in 2000 near the Paradox Valley in western Colorado and a M4.3 in 1953 near Green River, Utah," according to a USGS tectonic summary of the region. "The M4.4 earthquake in 2000 and many smaller earthquakes in the Paradox Valley were induced by brine injection in deep wells."